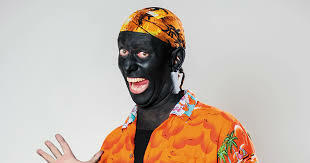 There have been two radio pieces lately, this one in English, this one in Spanish, about the struggle to get this racist character in blackface (el soldado Micolta, in the photo here) off the air in Colombia. Yes, in 2018. The Spanish piece kept the term blackface in English, and it seems there is truly no commonly used equivalent in Colombian Spanish. Is there in any other Latin American country? Anyone know? Is 'caranegra' or 'caranegra falsa' used anywhere?